HONG KONG–(BUSINESS WIRE)–Cavion, Inc., a leading clinical stage biotechnology company committed to developing novel therapeutics for people with neurological diseases, today announced promising results of the T-CALM Phase 2 clinical trial of its first-in-class T-type calcium channel modulator CX-8998 in essential tremor. The company plans to present results from this proof-of-concept study as a late-breaking poster on Monday, October 8 at the International Congress of Parkinson’s Disease and Movement Disorders® in Hong Kong. Multiple secondary and exploratory endpoints collectively showed that treatment with CX-8998 10mg twice daily resulted in statistically significant improvement versus placebo in activities of daily living and patient-reported and clinical outcome measures, despite the study’s primary endpoint being missed. In the study, CX-8998 demonstrated a favorable safety and tolerability profile, with patients in the drug treatment arm reporting higher levels of satisfaction with tremor control medication compared to patients on placebo. 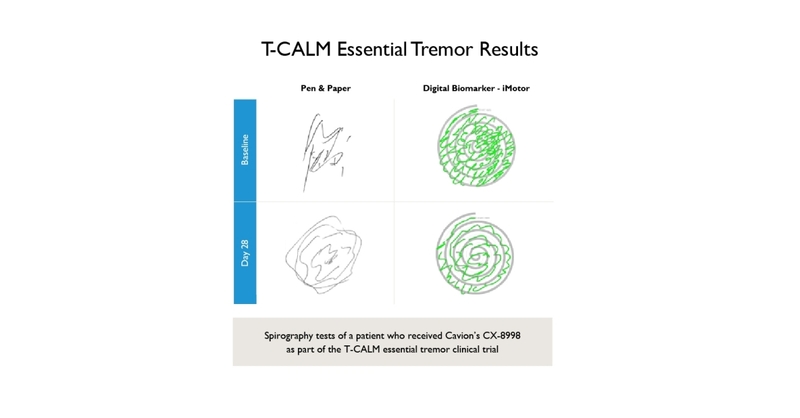 T-CALM was a 28-day, double-blind, placebo-controlled Phase 2 proof-of-concept clinical trial in 95 patients with moderate to severe essential tremor, conducted at 25 sites across the United States. Patients were randomized to receive either placebo or CX-8998 titrated up to 10mg dosed twice daily (BID). A majority of subjects (64 percent) added study drug to their existing standard of care anti-tremor medication. The primary study endpoint using remote video rating of the Tremor Research Group Essential Tremor Rating Assessment Scale – Performance Subscale (TETRAS-PS), a measure of tremor severity, did not meet significance at Day 28 (p=0.696). In contrast, the same TETRAS-PS scale rated by the study investigators who observed the patients in person resulted in a significant improvement in tremor severity at Day 28 for the CX-8998 treated group compared to placebo (p=0.027). Independent analysis of the video rating process uncovered unexpected complications in implementation. Cavion is working closely with the scientific community to enhance central video rating for use in interventional studies. In addition, the Patient Global Impression of Change (PGI-C), a measure of patient-reported improvement, trended towards significance favoring CX-8998 (p=0.089). Kinesia One, an algorithm-based digital measure developed for Parkinson’s disease, failed to detect a treatment difference in Essential Tremor patients. Additional analyses, including patient satisfaction with control by anti-tremor medication and traditional and digital spirography, support a treatment benefit with CX-8998. The drug showed a favorable safety and tolerability profile, with the majority of adverse events mild to moderate, transient and non-recurring. No major differences between CX-8998 and placebo were observed in laboratory values, vital signs or electrocardiography. The T-CALM study is one of the largest Phase 2 clinical trials ever conducted in essential tremor. This 28-day, double-blind, placebo-controlled proof of concept study recruited 95 patients with moderate to severe essential tremor at 25 sites across the United States. Patients were randomized to one of two treatment arms, receiving either placebo or CX-8998 on top of certain standard of care medications. The average age of patients in the study was 63, with an average of 23 years since tremor onset. About two-thirds (64 percent) of participants were on background standard of care anti-tremor medications during the trial. The study design called for dosing of CX-8998 starting at 4 mg BID (one week), followed by 8 mg BID (one week) and 10 mg BID for the last 2 weeks, ending at day 28 of the study. Cavion, Inc. is a privately held clinical stage biotechnology company creating therapies aimed at modulating the T-type calcium channel for the treatment of chronic and rare neurological diseases. Cavion’s portfolio of T-type calcium channel modulators is being developed to restore the brain’s natural rhythms in a variety of neurological diseases such as essential tremor, Parkinson’s disease tremor, neuropathic pain, and epilepsy with absence seizures. This press release contains forward-looking statements that are subject to risks and uncertainties and includes statements that are not historical facts. Actual results could differ significantly from results discussed. All p values in this release, other than the primary endpoint, are considered nominal. Cavion, Inc. disclaims any intent or obligation to update forward-looking statements, except as required by law.